PRAYER PROMPT ••• Pride is a part of our culture. We see it plastered all over social media — new homes, new cars, vacations, accomplishments, and more. The culture of pride has put us in a technological game of “keeping up with the Jones’s” with our ongoing pursuits to show the world what we have through the platforms of Facebook, Twitter, Instagram, and the seemingly endless list of social media channels. As a result, despite the pride we demonstrate, many of us have a deep rooted sense of dissatisfaction in the blessings we DO have, because we compare what we are showing off with the things others are showing off. We mistakenly think that what another has would make us happier. We live in an online world where the grass is always greener on someone else’s IP address. Frankly, I could go on all day about this, but the root of my point is this — pride gets us nowhere. It’s a vicious cycle that gives us a temporary thrill until we realize it’s not enough. No one is better than another person. What we take pride in will always be short lived. Instead, if we put on a cloak of humility, we can find eternal peace through Jesus. When we come to Him with a humble heart, we become grateful. We know we haven’t earned His favor with our good deeds or fancy car or money in the bank; nothing we have or do is going to earn us a place in heaven. Instead, our humility brings appreciation for His blessings and with appreciation, we find peace and contentment. 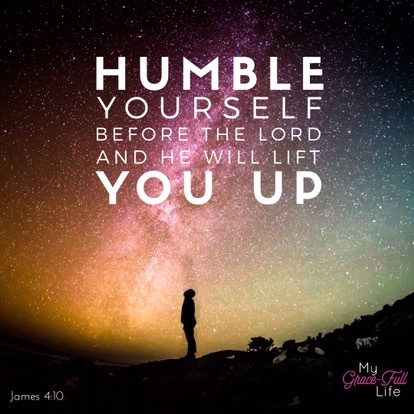 Today, as you pray, ask the Holy Spirit to keep you humble. Ask Him to remove pride and replace it with gratitude.